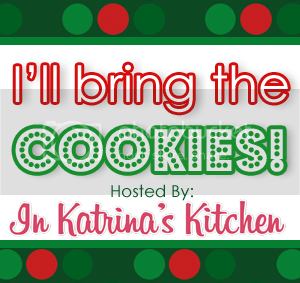 I’m bringing White Christmas Pie Cookies to the party today and I want to thank Katrina so much for inviting me. I will be adding many to my must bake list! 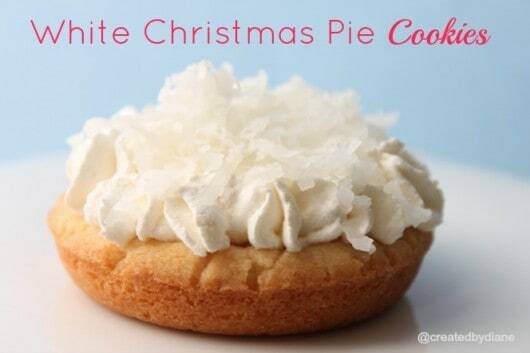 I remember many years ago my mom making White Christmas Pie, It was white and fluffy and covered with coconut on top. It was so pretty and white, I do believe that if you served it, you could just be lucky enough to wind up with a “White” Christmas. Oh how wonderful that would be to have the ground covered in snow. Chances are it won’t be happening at my home this year, we live in Southern California. I lived here for 12 years and before that I lived in New Jersey where I was born and raised and can remember having a White Christmas a time or two, maybe it was because my mom made White Christmas Pie. Well, anything is possible. It is Christmas after all. The time of believing anything is possible. I took my fond memory of my moms Christmas Pie and make it into a coconut sugar cookie, with very fluffy white coconut frosting topped with….oh you guessed it…coconut. The focus on my blog Created by Diane is on both sweet treats as well as savory recipes. I like to prepare easy dinners and fun appetizers along with all the yummy desserts. I hope you’ll stop by and say hi! Pressing the dough into the deep dish cookie pan with the bottom of a measuring cup makes the tops smooth. The cookies removed easily with a plastic spreader, I place it on the edge of one of the cookies and pop them out when they are cooled. 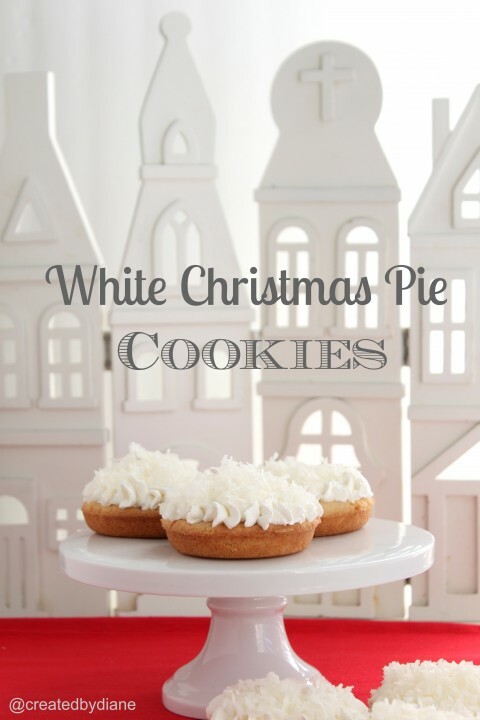 Pipe the fluffy frosting onto the cookies and top with coconut. Mix in flour along with baking powder and salt. Mix until dough pulls away from sides of bowl. 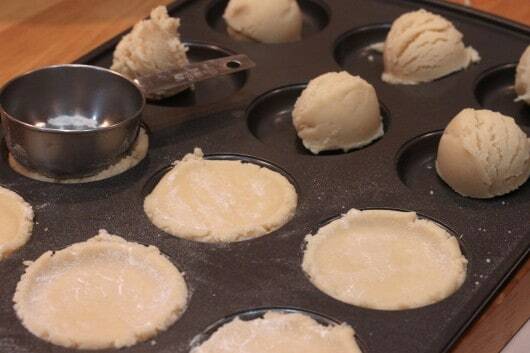 Place 3 tablespoons of dough into each section of a deep dish cookie pan. Press down the dough with a smooth item, like the bottom of a ½ cup measuring cup dipped in flour. 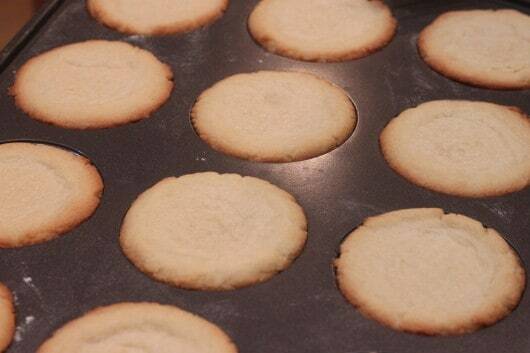 Bake at 375 degrees for 10 minutes or until centers are set and edges are golden. Add powdered sugar and mix until incorporated on medium low speed. Add in the heavy cream, coconut emulsion and white coloring and whip on high speed until it’s very smooth and creamy. Assembly: Pipe frosting onto cooled cookies with a piping bag fitted with a star tip, I use a 2D tip. Top with coconut. If the coconut is very moist and translucent and you’d like it more opaque heat it on low in a skillet for a few minutes being careful not to brown it and then you can quickly chill it by placing it in a thin layer on a plate and putting it in the freezer. I literally gasped when I opened up the email containing this post. I don’t know if Diane is familiar with me extreme love of vanilla or coconut but this recipe was made just for my tastes! Dear Santa, I want a deep dish cookie pan under the tree please!! Thanks for bringing the cookies, Diane! These cookies look so fabulous! White Christmas, indeed! These are beautiful! These sound amazing and look so pretty, Diane! Merry Christmas! Thank you so much for having me guest post today Katrina! I just LOVE coconut and am so glad you do too. These litlle pies look so divine! I can hardly wait to try out the recipe! I really like this idea. Thank you for sharing. i had to pin it for future reference. coconut, coconut, and more coconut. Yep, I think these beautiful cookies were made just for me. WOW! They look perfect and I LOVE coconut + cookies together. 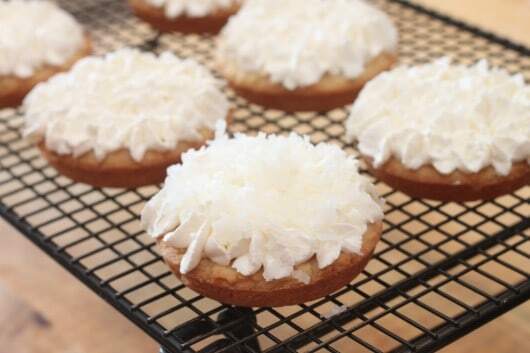 I am really intrigued by the concept of deep dish cookies and absolutely love everything coconut!